When you build your own home or convert your oil heating system to Gas, anything that will keep your home warm & cosy and still save cash is a welcome relief. So, when you install a new Flogas Cosy Home heating system, we'll give you a free gas boiler. Now that's an offer yourre sure to warm to! Improved efficiency will reduce your gas bills. We will check for scale damage to your boiler and system. 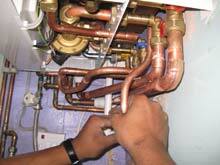 We will check your radiators, radiator valves and exposed pipework for leaks and corrosion. All gas boilers should be serviced in compliance with its manufacturers instruction. A regularly serviced boiler is a safe boiler just like a NCT on your car. A regular serviced/maintained boiler is less likely to breakdown. 1. Have the Boiler Serviced annually - the summer is the best time. All Service Engineers are extremely busy during the winter. 2. Are the timer/ programmer set correctly? Is your thermostat set too high and possibly save you €€€€. 4. Ensure all pipes are lagged/ insulated correctly. 5. Insulate your loft - most heat escapes through your roof. 6. Check for draughts around windows/ doors & letterboxes and insulate if necessary. Turn the gas supply off immediately at the meter or storage tank. If necessary, ventilate the building by opening windows and doors. Ensure access to the premises can be made. There are a number of cheap and easy energy efficiency measures which you can take in order to make your home energy friendly. In taking these simple steps you'll not only save money but you'll also be helping to save the environment. Start saving money now! Don't leave your appliances on standby. Turn the TV off if no one is watching it. Replace three regular light bulbs with three energy saving ones. Defrost your freezer regularly to keep it running efficiently and therefore cheaply. Try to only use your dishwasher and washing machine when it has a full load. Only heat areas of the house you use, for example turn off the radiator in the spare bedroom. 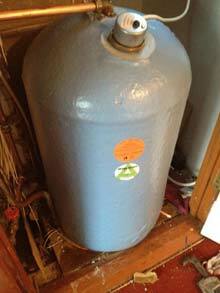 Place an insulating jacket over your hot water tank. This can save up to €130 a year. Don't overheat your home. Turning your thermostat down by one degree can reduce your fuel consumption by around 10%. Conserving water in the home not only saves you money, it also helps to protect the environment. On average, we all use 160 litres of water a day in the home for cooking, drinking and washing. Modern appliances, such as washing machines and dishwashers can assist us with our daily chores, but use large amounts of water. By making some small changes in our daily routine, we can start to save water in our homes. Approximately 80% of household water use is at the washbasin. Don't leave the tap running while you brush your teeth, shave or wash your hands as this can waste up to 5 Litres of water per minute. Spray taps typically save up to 80% of the water and energy used with standard pillar taps. Each cycle of a washing machine uses up to 100 litres, so make sure you only use your washing machine when you have a full load. When purchasing an appliance, choose one that is water efficient. Wash your car with a bucket and sponge. A hosepipe can use up to 100 litres of water an hour. Leaking taps - one drip per second wastes 15 litres of water per day. Drips can also stain your bath or sink and the tap seating could be permanently damaged.